Flow Research is conducting a new study on the worldwide pressure transmitter market called The World Market for Pressure Transmitters, 4th Edition. The primary goal is to determine the size of the pressure transmitter market in 2017. Forecasts through 2022 will be included. Pressure is a state or condition we face everyday. We speak of being “under pressure”, and talking about putting pressure on another person or situation. Fundamentally, the idea of pressure is the idea of the continuous exertion of force. From a measurement perspective, pressure is force per unit area. The idea of atmospheric pressure also plays an important role in pressure measurement by pressure transmitters. In process control, pressure measurement occurs in a variety of contexts, especially including the measurement of the pressure exerted by liquid, steam, and gas. Pressure is one of the most widely measured variables in the process industries. In the oil & gas industry, wellhead pressures are measured in subsea and topside locations. Pressure measurement is used in pipelines to help create a liquid interface detector for liquids in pipelines. In water towers, pressure is measured to monitor and control water levels. Pressure sensors are used to monitor the water pipe pressure in automatic sprinkling systems. And one of the most common measurements is barometric pressure, which is used to predict the weather. Just as there are many applications for pressure measurement, there are also many different instruments used for pressure measurement. These include pressure gauges, pressure sensors, pressure transducers, and pressure transmitters. There are also specialized devices for measuring pressure extremes, such as vacuum pressure. While pressure sensors can detect variations in pressure by converting changes in resistance or capacitance to electrical values, these electrical signals are relatively weak. These signals are not strong enough to be transmitted over distances, or sent to a controller that may be located at a long distance from the pressure sensor. To accomplish this, a pressure transmitter is required. A pressure transmitter contains a pressure sensor, plus a signal conditioner to amplify the output from the pressure sensor. Pressure transmitters also typically contain a display that shows the pressure value that is conveyed by the pressure sensor and convert into a standardized output. This output is typically either 4-20mA or a digital signal. There are four main types of pressure transmitters: absolute, gauge, differential pressure, and multivariable. Absolute pressure transmitters, which sense absolute pressure, are referenced to a full vacuum. The pressure of the measured media is compared against the reference pressure of an absolute vacuum in a sealed reference chamber. Absolute pressure transmitters are used to measure pressures that are not influenced by atmospheric pressures. Vacuum transmitters are often used where high accuracy is required, and are used for applications such as low pressure measurement of vacuum distillation columns. Gauge pressure transmitters, which sense gauge pressure, are referenced to atmospheric conditions. Gauge transmitters are vented to atmospheric pressure rather than to an absolute vacuum. Gauge pressure transmitters are widely used in the process industries to measure the pressures of liquid, gas, and steam. Both absolute and gauge pressure transmitters are growing in part by replacing pressure gauges, switches, and transducers. Pressure transmitters are more stable and reliable than pressure transducers. As end-users increasingly automate their operations, and also build new plants, they are more likely to choose pressure transmitters over pressure transducers. Absolute and gauge pressure transmitters also have the advantage that, unlike differential pressure transmitters used for flow, they do not have another technology that is replacing them. Differential pressure (DP) transmitters measure the difference between two pressures. They are used for both flow and level applications. When used for flow applications, they measure the difference between pressures on the upstream and downstream side of a constriction in the pipe, called a primary element. This difference in pressure is used to compute flowrate. DP transmitters have been used for more than 100 years to measure flowrate. They have a pronounced advantage over other types of flowmeters in installed base. Despite this, they are being displaced in some applications by new-technology flowmeters such as Coriolis and ultrasonic. This is especially the case when higher accuracy and greater reliability is required. Multivariable pressure transmitters measure two or more process variables. In many cases, they measure volumetric flow, along with pressure and temperature, and use these values to compute mass flow. 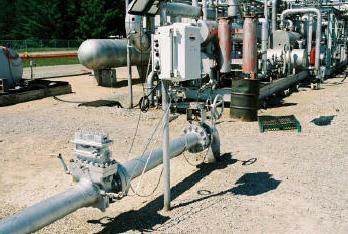 Multivariable transmitters are becoming more widely used for steam and gas flow measurement. While they are more expensive than single variable DP transmitters, they typically cost less than buying a DP transmitter, along with single pressure and temperature transmitters. Multivariable transmitters were first introduced in 1992 by Bristol Babcock, now part of Emerson Process Management. Pressure sensors operate by sensing pressure and converting it into an electrical quantity. Two of the main types used are piezoresistive and capacitive. Piezoresistive is the most commonly used. Piezoresistive materials change resistance to the flow of current when they are strained or compressed. A piezoresistive pressure sensor consists of a micro-machined silicon diaphragm that has a piezoresistive strain gauge diffused into it. The diaphragm is fused to a silicon or glass backplate. The sensor contains resistors that are typically arranged in the form of a Wheatstone Bridge Circuit. As pressure increases on the silicon, it is more resistant to current passing through it. As a result, the output of the Wheatstone Bridge is proportional to pressure. Capacitive pressure sensors, use a thin diaphragm as one plate of a capacitor. This diaphragm is usually metal or metal-coated quartz. The diaphragm is exposed to a reference pressure on one side and to the process pressure on the other. Pressure changes cause changes in the capacitance. Pressure changes can be determined by monitoring the changes in capacitance values. Pressure transducers resemble pressure transmitters, but they are generally lower in cost and smaller than pressure transmitters. They often have loose wires at one end and do not perform at the same level as pressure transmitters. Pressure transducers are widely used in the discrete industries such as automotive and plastics. They are less typically used in the process industries. Pressure gauges are relatively inexpensive mechanical devices that, for the most part, are read manually. One of the most well-known types is called the Bourdon gauge, which was patented in France by Eugene Bourdon in 1849. In 1852, Edward Ashcroft bought the American rights to the design of the Bourdon gauge and founded the Ashcroft Manufacturing Company to make pressure gauges for steam engines. This was the beginning of the company that is today known as Ashcroft, Inc. Ashcroft is located in Stratford , Connecticut , and it still sells pressure gauges, along with a variety of other products including pressure transducers and transmitters, pressure and temperature switches, and test instruments. Bourdon gauges contain a thin-walled metal tube that is typically threaded into the compartment whose pressure is being measured. As pressure increases in the tube, the tube begins to straighten. On the other end of the tube is a lever system that contains a pointer. As the tube straightens, the pointer moves around a dial, indicating pressure in pounds per square inch (psi). Common tube shapes include curved or C-shaped, spiral, and helical. This is a mechanical device that is manually read. Another type of mechanical gauge that operates in a similar fashion and also contains a pointer is called a diaphragm gauge. Traditional gauges such as the Bourdon and diaphragm gauges are sensitive to vibration and condensation. Another type is called a “filled” pressure gauge, and it is filled with a viscous oil. This design has fewer moving parts than the traditional pressure gauges, and is more reliable. This design dampens pointer vibration and is not susceptible to condensation.